Welcome to ACBOSG - A Crap Bit Of Something Good! Sometimes life is ACBOSG. ACBOSG is a crap bit of something good. Daily disappointments, awkward moments and life's not fair come together in a three-panel worldview for your enjoyment. 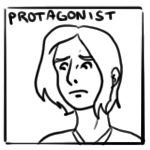 Protagonist often gets really excited about things only to become underwhelmed or disappointed. Sometimes she says things that are unintentionally funny. BF somehow has fewer problems than Protagonist. 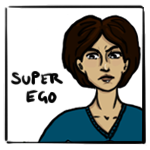 You wouldn't want to mess with Super Ego. Constantly watching and criticising Protagonist's every move, she has an almost perfect existence. Catface - Protagonist's ginger-coloured cat friend is exceedingly cute but dangerously fluffy. Bowies - No one quite knows whence or wherefore he came, but it looks as though he's here to stay. Q: I don't actually have any questions. A: Don't worry, I have imagined possible questions imaginary readers could potentially ask. Q: Why do you colour in only bits of the comic? A: Colour is mostly bright, though there are dark varieties too. It can be used to highlight potential areas of an image and in the harmonious or dishamonious composition of the picture. Q: Why are there faces in the sun / in inanimate objects / why are there mushrooms sometimes? A: Faces are very expressive and can tell us a lot about character and mood. All things become more communicative when adorned with a face. A: Think of them as mysterious plants scattered among a magical meadow full of enjoyable flowers. Q: What is 'Mah Person' and why are there 'eh's at the ends of words and general corruption of the English language? A: Sometimes it is amusing to challenge and subvert expectations of how words are written and juxtapose it with their pronunciation, for example through the addition of a comedy consonant, such as 'h'. Q: What does it say on Bowies's T-shirt? A: It says MWFTE and there is a picture of an arrow pointing to Earth. It is an initialism of that 70s cinematic classic, [The] Man Who Fell To Earth, which starred Real Bowies as an alien. 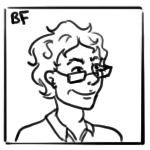 Q: I love ACBOSG and you have inspired me to start my own comic / be an artist / like Bowies / save the world. But how do I do it? A: Perhaps slowly but definitely surely, you will succeed in your endeavour through belief in yourself. Mary J Lockwood is a top-secret, crime-busting, intergalactic superhero who also tells stories. Charlotte Forsdick is a director - her portfolio of work is thought-provoking and engaging. YourBoyfriendRemindsMeOf - a series of poems for those occasions when you can't quite bring yourself to tell your friend the Truth about their boyfriend. This blog does all the hard work for you. Avoiding the Bears, with comics, delightful, helps you avoid bears. Lobsterfone is what you always wanted but didn't know why, supplied by the eponymous Crustacean Communication Specialist. Pika La Cynique's Girls Next Door is my inner fangirl dream come true. The artist also has a graphic novel and a short story, among other things. There are also more things I enjoy, this list shall grow and thrive. Watch this space. NOTE: This is mostly a work of fiction. Names, characters, places and incidents either are the product of the author’s limitedimagination or are used ironically fictitiously, and any resemblance to actual persons, living or dead, business establishments, events or locales is on the whole entirely coincidental.